Also serving communities of Trinity. There are 61 Assisted Living Facilities in the Holiday area, with 2 in Holiday and 59 nearby. The average cost of assisted living in Holiday is $3,600 per month. This is higher than the national median of $3,346. Cheaper nearby regions include Tarpon Springs with an average starting cost of $2,123. To help you with your search, browse the 384 reviews below for assisted living facilities in Holiday. On average, consumers rate assisted living in Holiday 4.6 out of 5 stars. Better rated regions include Hudson with an average rating of 4.7 out of 5 stars. Caring.com has helped thousands of families find high-quality senior care. To speak with one of our Family Advisors about assisted living options and costs in Holiday, call (855) 863-8283. Nature-lovers have plenty of opportunities to enjoy the outdoors in Holiday. Seniors may wish to fish or watch the dolphins at Anclote River Park, and the city is also home to a section of the Great Florida Birding and Wildlife Trail. Holiday is home to a sizable senior population, with more than 21 percent of the city's 22,000 residents aged 65 and older. There are 61 assisted living facilities in the area offering care to seniors who are mostly independent but need help with daily activities. They're monitored and licensed by Florida's Agency for Health Care Administration. The Tampa-St. Petersburg-Clearwater metropolitan area, including Holiday, tied first for the cleanest metropolitan area in the country for 24-hour particle pollution in the State of the Air 2018 report. Lee County also received a B grade for ozone pollution. Seniors with respiratory conditions may find their health improves in the clean air. Pasco County Public Transportation runs a bus service in Holiday and seniors aged 65 and older are eligible for a reduced fare. A door-to-door reservation service is also available in the county for people who aren't able to use the regular service. Holiday has warm weather throughout the year, with a January low averaging 50 degrees and an average high in July of 90. The city gets 245 sunny days each year, 40 more than the national average, which allows seniors to spend their days in the Florida sunshine. The Holiday area is home to world-class medical facilities, including AdventHealth North Pinellas, in the event of medical emergencies or illness. The Sperling index rates Holiday's overall cost of living at 88, 12 points lower than the national average. This is largely due to the low cost of housing. Seniors can find everyday expenses at rates closer to the national median, with healthcare slightly lower and groceries and utilities slightly higher. Florida has no state income tax, which means seniors in Holiday have a lower tax bill no matter their source of retirement income. The sales tax in Holiday is lower than the national average so seniors can save more money for their assisted living budget. Assisted Living costs in Holiday start around $3,600 per month on average, while the nationwide average cost of assisted living is $4,000 per month, according to the latest figures from Genworth’s Cost of Care Survey. It’s important to note that assisted living rates in Holiday and the surrounding suburbs can vary widely based on factors such as location, the level of care needed, apartment size and the types of amenities offered at each community. The Optional State Supplement is available to eligible seniors in Holiday who receive Social Security Income. 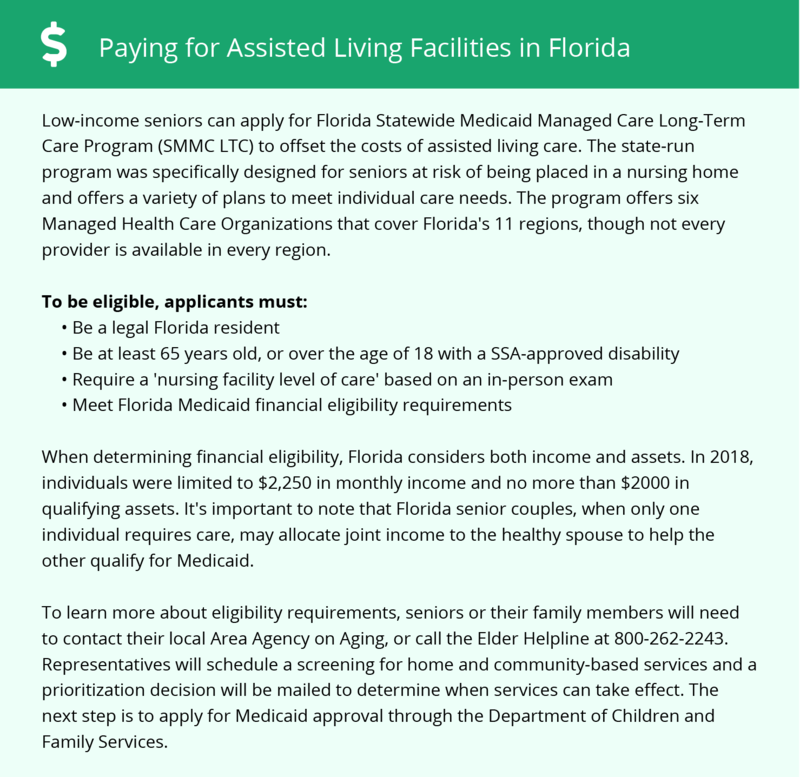 Florida also has financial assistance available to seniors in assisted living through the Medicaid Long-Term Care Program or the Assistive Care Services waiver. Holiday and the surrounding area are home to numerous government agencies and non-profit organizations offering help for seniors searching for or currently residing in an assisted living community. These organizations can also provide assistance in a number of other eldercare services such as geriatric care management, elder law advice, estate planning, finding home care and health and wellness programs. To see a list of free assisted living resources in Holiday, please visit our Assisted Living in Florida page. Holiday-area assisted living communities must adhere to the comprehensive set of state laws and regulations that all assisted living communities in Florida are required to follow. Visit our Assisted Living in Florida page for more information about these laws.